If you’ve never been to the Houston Livestock Show & Rodeo, let me paint you a picture. The HLSR is the world’s largest live entertainment and livestock exhibition. It’s enormous, basically. The rodeo events take place inside Reliant Stadium, which is, you guessed it, huge. And the carnival and livestock show take place on the surrounding properties. My OBGYN happens to be just down the street from the rodeo festivities. 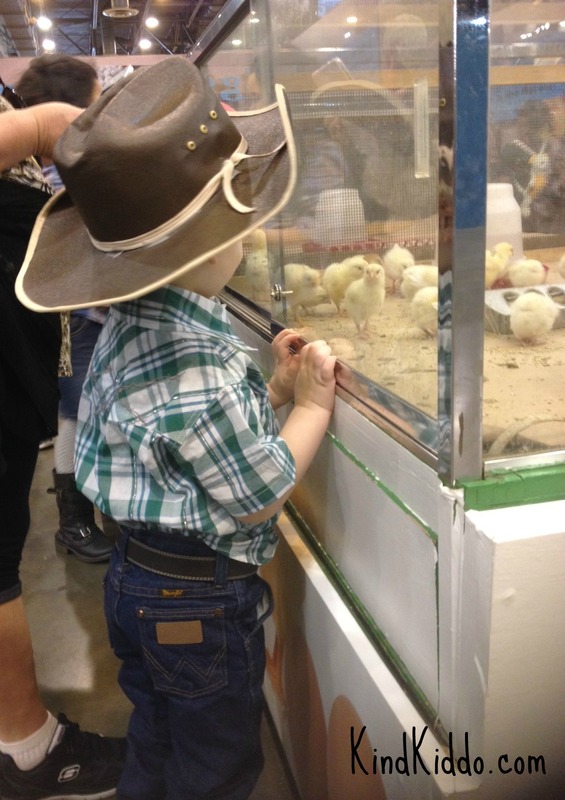 So since I had a pregnancy check-up the other day, we decided to take our 2-year-old (he’ll be 3 in June) to the livestock show and carnival after the doctor visit…on a Friday…during spring break. We were intentionally skipping the actual rodeo events due to our assumption that Rowdy isn’t quite old enough to patiently sit and watch something (anything) for 3 hours, even if it is loud and exciting and full of cows and horses. But he loved riding the kiddie ride at our local county fair and he definitely loves farm animals, so we were looking forward to a great time at the carnival and livestock exhibits. First of all, we had to park what was quite possibly 2 miles away from the festivities. And then we had to stroll on up to the front of the parking lot to catch the tram that drove us onto the rodeo property. Of course I’m thankful for the tram, and the folks were super nice, but still. Parking always seems to be quite the ordeal at big events, doesn’t it? And it was $12. Oh, and we had only used our new stroller once before so we fumbled with it trying to fold it up for what seemed like forever before boarding the tram. In all reality it was probably only 30 seconds, but when you’re holding up a line of 100 people, every second seems like an hour. We arrived, paid our entry fee and headed directly toward the livestock exhibits. The good news? They were indoors in a huge building with REAL bathrooms, not porta-potties. As you can see in the photo above, Rowdy loved watching the chicks. In fact, after we left them he said “chicks?” numerous times. I truly think we could have just sat there in front of those chicks for the next hour and he would have been thrilled. But, no. We had to go, go, go. Our next adventure was lunch. After discovering that the place we ordered food from took cash only (seriously?) we had to get out of line. I mean, we had cash on us, but eating at these things isn’t cheap. I didn’t have enough cash to pay for lunch. I began stressing (I’m 7 months pregnant – FYI) about feeding Rowdy and finding something he would like because he’s so picky. Thank goodness I packed plenty of snacks. And thank goodness for that nice lady that told me I was a good mom for bringing grapes. I needed a little positivity at that precise moment. Mommy and Daddy ended up settling for something that wasn’t all that great, but whatever. We survived lunch…barely. Continuing our “fun”, we purchased $20 worth of carnival tickets so that our little guy could ride a couple of rides and maybe play a game or two. The pink elephant ride only took AN HOUR of our time. That guy had to be competing for the slowest carnival ride attendant ever. But there were benches for this pregnant chick to rest on, and when Rowdy rode that little elephant with his daddy, his huge smile made it all worth it. And even though our sweet little bud thoroughly enjoyed the ride, we decided to move on to games so that we didn’t spend the next 20 years in long lines. We proceeded to blow the rest of our carnival credits on games, and managed to win a few little stuffed toys. At this point we had been there for 3 hours. We were tired. My body ached. It was time to go home. After an excursion that lasted a total of 7 hours, included one 2-year-old breakdown, multiple pregnant lady breakdowns, a few miles worth of walking, some fabulous baby chicks, a thrilling pink elephant ride and enough money spent to buy a dinner for two at Smith & Wollensky, our adventure was over. I laugh out loud now thinking of my husband having to deal with all of this. I must say that he did pretty well and never snapped. And this is yet another lesson we learned as parents – the ones you learn after experiencing something with your child the first time. There are only certain places and activities suitable for very young children and babies. Don’t get me wrong. We were one of many families there that included a child small enough for a stroller. But that doesn’t mean it’s a great idea to take a 2-year-old, who doesn’t even know the Houston Rodeo exists mind you, to the biggest damn rodeo carnival known to man. We could have bought him a chick and let him watch it in a cage in the backyard all day long for less money, less pain and less effort. But even though we wouldn’t recommend this specific type of “fun” for a family with merely one toddler to take, it doesn’t mean we didn’t enjoy the time together. And it certainly doesn’t mean we won’t be laughing at ourselves over this one for years to come. P.S. I didn’t even get a damn funnel cake.